Compression is a clear example of how the greater use of technology can expedite and streamline trading processes, while helping market participants comply with regulatory requirements. Today the need to optimise portfolio management of outstanding line items via compression represents a significant portion of buy-side trading activity on swap execution facilities (SEFs). On Tradeweb alone over $6.6 trillion in notional has been compressed since November 2013. Tradeweb led the industry with the first electronic compression trade completed on its SEF. Under the Dodd-Frank Act, SEFs were created as new electronic trading venues, alongside exchanges, to support trading by “US Persons” of interest rate and credit default swaps designated as Made Available to Trade (MAT). One of the provisions of the Dodd-Frank Act was that certain swap transactions would be prohibited unless they were submitted to a Derivatives Clearing Organization (DCO) for clearing. This requirement created a need for swaps users to efficiently manage a greater number of line items at the clearinghouse, where each outstanding transaction increases costs and risk. Clearinghouses set forth guidelines through which swaps can be netted out or removed from their systems. To meet these guidelines, participants have to execute an exact offsetting swap – which is not the same as just offsetting risk – that accounts for every attribute of the original swap. Previously for cleared trades, buy-side customers would send spreadsheets with all of the trades they wanted to compress to dealers, who would review each swap and provide pricing for the list of trades. This process took a fairly long time, as participants weren’t able to easily shop these types of trades to multiple dealers and then had to manually book all the offsetting positions, which carried the risk of potential booking errors. Another implication was that if the dealer was going to spend the time pricing the compression list, it would be executed with them. On electronic execution venues like Tradeweb, however, each part of the trade lifecycle – from pre-trade credit check to trade execution to clearing to reporting – is done via straight-through processing, resulting in a seamless process to the end-user. A client will first load up a compression ticket with the details of the trade(s) they are looking to compress. They can do this by uploading a list through an order management system, pulling historical details from the Tradeweb blotter, adding swaps directly on the Tradeweb screens or entering the trades through a spreadsheet. Once they have a list of up to 150 trades, they can initiate a pre-trade credit check, select dealers, run a validation to see if the swaps are MAT, and send a request-for-quote (RFQ). The dealers will then price the entire list and send it back to the customer, who can execute the all-or-none list on the aggregate price of the total list of swaps. Once both parties agree, the trade is executed and processed like any other swap traded on Tradeweb; it is then sent to the Swap Data Repository (SDR) for reporting and to the clearinghouse for clearing. Customer feedback has been extremely positive as evidenced by growing volumes. According to ClarusFT, Tradeweb had the largest market share of IRS trading in August and September 2016 among SEFs, and also has the leading compression tool. In addition, we were awarded Best Compression/Compaction Service of the Year by GlobalCapital in June 2016. 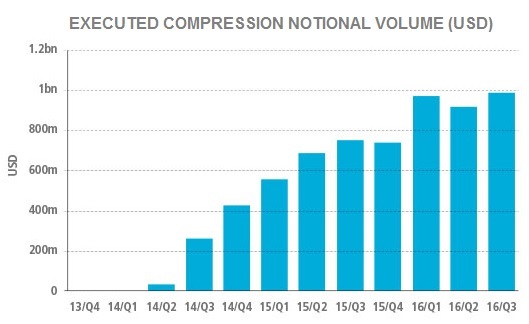 Compression volumes continue to grow as market participants have become comfortable with trading derivatives on SEFs and executing electronically. In Europe as well, traders are embracing the functionality, even ahead of mandated clearing under the European markets Infrastructure Regulation (EMIR). What started as a time-consuming manual process of netting or terminating individual trades sitting on books at the clearinghouse has evolved into an indispensable part of derivatives trading on regulated venues.